Within a bioeconomic framework which seeks to achieve green, sustainable growth in Europe, the production of biomass as a renewable energy source forms part of a challenging move towards a low emission production model which will contribute to mitigating climate change, improve energy security and encourage rural development in the European Union. Given its characteristics, lignocellulosic biomass is considered to be a highly suitable source of energy for these purposes. 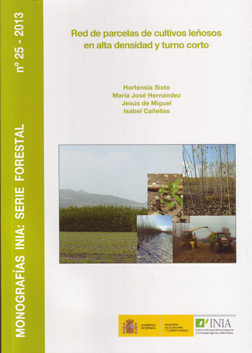 It is hoped that the network of plots of short-rotation woody crops at high densities (RPL) described in this monograph will facilitate the acquisition of important information at national level on aspects related to the growth of forest species and in particular Populus spp. In order to achieve a sustainable increase in biomass production from short rotation poplar plantations it is first necessary to identify the behavior of the vegetal material, the productivity of the site and the most relevant aspects of crop management. Many of these aspects are of particular importance not only as regards improvement but also at practical level for the grower. This network has been established thanks to funding from various competitive projects, the common objective of which is to extend our knowledge regarding woody crop plantations for biomass energy production. Using a common protocol, there has been involvement from public research centers at national and regional level, agricultural associations as well as large and small companies related to the renewable energy sector. All of these exhort the need to expand the market for this source of energy. However, due to the current economic situation and in particular, the RDL moratorium 1/2012, scores of projects in this field are currently frozen, which means that the evolution of this sector is difficult to forsee. Physical Description : 188 p.; 24x17; il. This book was added to our online catalog on Thursday 12 December, 2013.